We greatley appreciate your time, patience, and effort with respect to our recent negotiations and discussions relative to a summit long sought by both parties, which was scheduled to take place on June 12 in Singapore. We were informed that the meeting was requested by North Korea, but that to us is totally irrelevant. I was very much looking forward to being there with you. Sadly, based on the tremendous anger and open hostility displayed in your most recent statement, I feel itis innappropriate, at this time, to have this long-planned meeting. 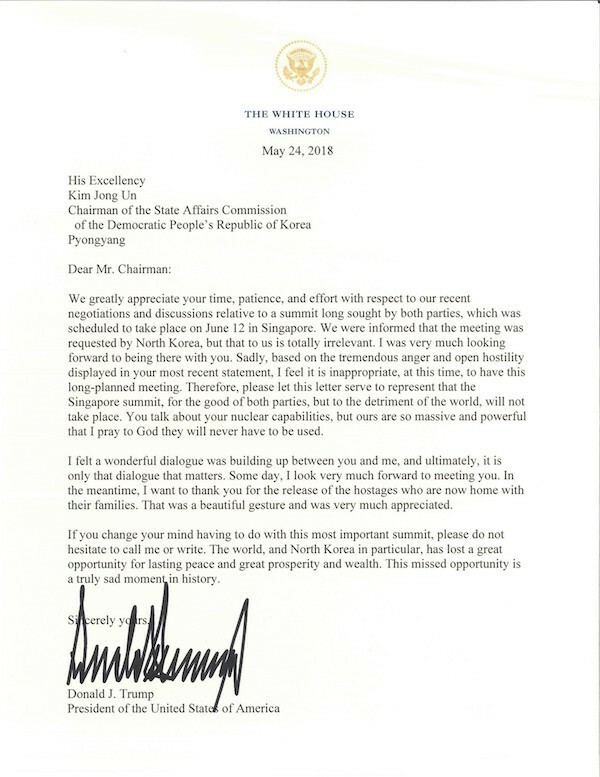 Therefore, please let this letter serve to represent that the Singapore summit, for the good of both parties, but to the detriment of the world, will not take place. You talk about your nuclear capabilities, but ours are so massive and powerful that I pray to God they will never have to be used. I felt a wonderful dialogue was building up between you and me, and ulimately, it is only that dialogue that matters. Some day, I look very much forward to meeting you. In the meantime, I want to thank you for the release of the hostates who are now home with thier families. That was a beautiful gesture and was very much appreciate. If you change your mind having to do with this most important summit, please do no hesitate to call or write. The world, and North Korea in paticular, has lost a great opportunity fo lasting pease and great prosperity and wealth. This missed opportunity is a truly sad moment in the history.